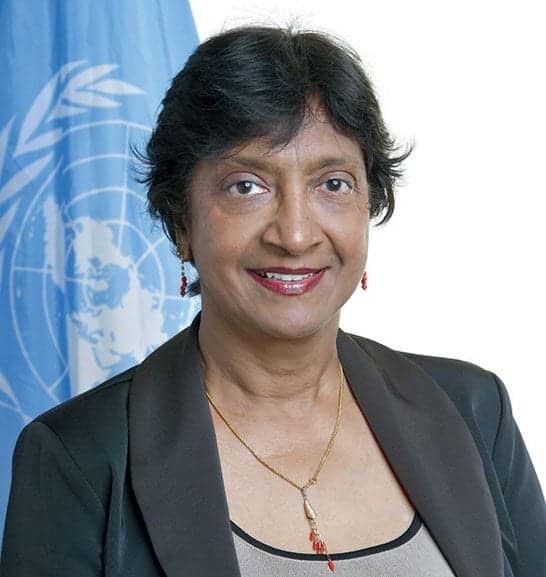 United Nations Human Rights commissioner Navi Pillay said Monday that gay soccer players at the World Cup in Brazil should come out and declare their sexuality to help foster global LGBT visibility and equality. "I encourage players, sports people to declare their sexual orientation without fear," she told reporters in Geneva. "That's the only way they will find the right to sexual orientation accepted. They are role models, it's important to send this message to their fans as well," Pillay said, adding that it was "a shame, in this day and age", that people "had to hide who they really are". Pillay also warned that governments bidding for major sporting competitions need to give more thought to how their bid would affect human rights in their country. "They risk becoming hubs of human rights violations, including misuse of public funds, child labour, forced evictions, and demolition and the sexual exploitation of human beings including children in the surge of tourism," Pillay said, without naming any particular city. The UN's concerns over the intersection of human rights and sporting events will likely continue into the foreseeable future as FIFA’s decision to select Qatar as host country for the 2022 World Cup has come under heavy criticism – at least in part due to the country’s laws making homosexuality illegal. There are currently no openly gay players participating in this year’s World Cup, although a few former athletes such as Germany’s Thomas Hitzlsperger and our own Robbie Rogers played in the World Cup before coming out.